My family and I had travelled to San Diego to watch two of our sons play baseball during our spring break of 2008. Life was full of uncertainty for me. I no longer had a career with a retirement plan, I had developed a vocabulary of a sailor, and my self worth was dwindling. Of course this was not apparent to the majority of those I surrounded myself with. I was serving on two community boards, mother of 4 sons ( ages 17, 16, 9 and 5), a wife and I started a massage business; I wanted to help everyone around me! During our week long stay we watched a lot of amazing high school baseball games, visited Coronado Beach, the San Diego Safari Park, and the USS Midway Museum. Our visit to the USS Midway was where my world of TRUST, FAITH and BELIEF began. My two younger sons had a huge desire to walk on the USS Midway. My husband and I obliged and the four of us boarded the ship. The boys thought it was cool to be on the USS Midway and see where the sailors spent their days. We had a map to guide us through the galleys, sailors’ bunks, café, gift shop, etc. I must insert here that I am not a big fan of crowds. I get extremely overwhelmed and claustrophobic easily which can lead my temperament to go astray (this has taken years to understand!!!). As the four of us followed a crowd of people into the area of the ship where the sailors’ bunks were located I began to notice how the bunks were crammed together and the ceiling became lower and lower. My feeling of uncomfortableness grew more and more with each step I took. My body became extremely warm, the feeling of nausea grew. My mind began racing. My mouth became sailor-like, expletives were leaving my mouth quicker than I knew I could cuss. I am embarrassed to admit but I kept saying under my breath was, “Jesus Christ!”, “Jesus Christ!”, “Jesus Christ!” The tone in which I said it was negative, frustrated beyond belief, and dark! If I could see my facial expression I am sure the look of SHOCK was all over it!! As this battle in my head continued, so did the feeling of nausea. If I didn’t get out of this bunk area I was going to loose my lunch and totally and completely embarrass my family. I had become beyond claustrophobic and needed out! So, I turned my negative expression of Jesus Christ into a more empathetic tone, pleading to Jesus to please assist me in getting out of this bunk area and to fresh air. I turned to my family and let them know I couldn’t follow them any longer, I would meet them back on deck of the ship. As quickly as I decided to find my way out I began seeing all of the EXIT signs above the doorways all lit up. It was as if they were 100 percent brighter. Prior to turning inward to ask Jesus Christ for help I couldn’t find an exit sign. I hadn’t known where to go to get out of the bunk area. Now, all I could see were the EXIT signs. Before I knew it, I was on the deck of the USS Midway doing my best to not throw up. I staggered to a wooden bench to gather my strength. My nausea was not subsiding, I spotted a vending machine selling sodas. I walked over to the machine, digging in my purse to get out my wallet, I approached the vending machine, “What the F%*K,” I said in my head. “$5 F%*King for a soda,” continued my conversation in my head. Had I not just experienced the assistance of Jesus’ in finding my way out of the sailors’ bunks and I am already out of balance and into the same old pissed off attitude. “Come on girl,” I say to myself, get a grip. I looked in my wallet to find a handful of dollar bills. One by one, I put a dollar into the vending machine to purchase a lemon lime soda. As I get to the fifth dollar the soda machine keeps rejecting it. I put in the dollar and the machine spits it back out. I flatten the edges, put it back in, rejected. I try several times and the dollar wouldn’t work. I go back into my wallet, one more dollar bill was left. I replaced the rejected dollar in my wallet for a smooth dollar. Viola the machine accepts and within seconds I pop open the soda and allow the bubbles to calm my stomach. I walk back to the wooden bench drinking my soda when the dollar bill which kept being rejected comes into my mind. What was all that nonsense about? I go back into my wallet and pullout the dollar. 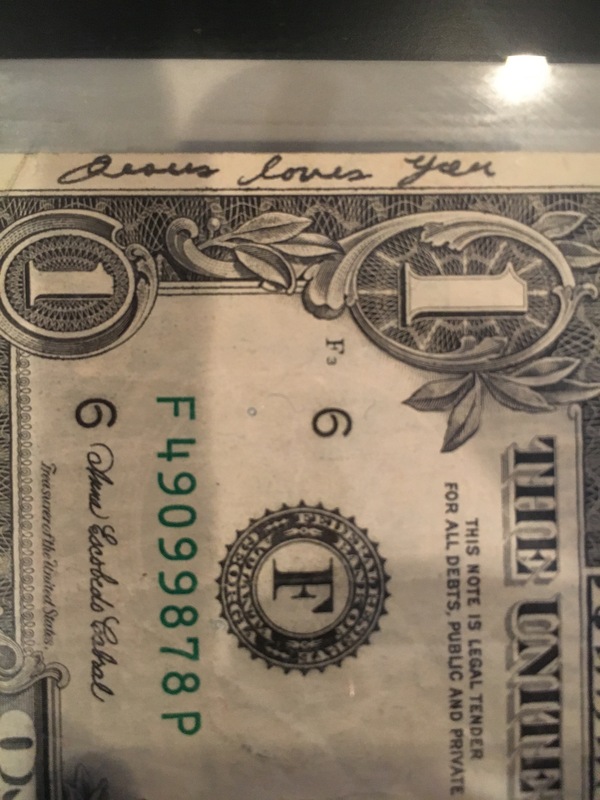 At close inspection I find the words “Jesus Loves You” written in ink on the left edge of the one dollar bill. I was beyond shocked to say the least. As I continued to look at the words “Jesus Loves You” my entire body was filled with goosebumps. To this day when goosebumps appear I KNOW that Divine Truth has found me. Whether its when I read a book and a profound sentence or statement feels right for me or while in a conversation with a friend and I get filled with goosebumps I absolutely know without a doubt something Divine is occurring. I knew with this evidence in hand Jesus had assisted me in getting out of the sailors’ bunk area. Jesus was wanting me to know He is here to assist us all simply by asking for his help. No thing is too small or big. I was in awe for the rest of the afternoon. To be honest, I don’t remember if I shared with my family the experience I had. It was a personal experience at the time. Besides, my family believes I am a bit nutty and very much in the category of whoo-whoo. I share this as my first story of writing “52 stories: The making of a creative, intuitive BEING” in hopes to share what a journey into awakening can look like. I have learned I simply need to ask for guidance in order for guidance to be given and to be open to how the guidance appears. This past week I have returned to an activity I was introduced to by Lynn Whipple in her online class called WORDPLAY. I glance through a book page simply see a word and circle it. Soon, I have a collection of words and phrases. The majority of the time I sense a theme. Once I find my completed thought I pullout my paintbrush and paint. I then block out the words with the paint. Today, I noticed I needed to bring out my rubber stamps and stamp in a word to tie it all together. During this activity I find my mind and heart settling into a calm and peaceful energy. I also begin having intuitive knowing of loving, kind thoughts about life, myself and others. This intuitive information is usually regarding questions I have raised during the previous day or even from that morning. You know, those questions you quietly think within your heart and send out to the Universe to someday bring in an answer. I suppose this activity is one way of meditating. It allows me to quiet my mind and unconsciously bring forth my thoughts and feelings. I also enjoy using magazines the same way. When I am feeling a bit restless and don’t feel like creating with paint I will pullout old magazines and a pair of scissors. Flipping through the pages of the magazine until a word jumps out at me. I will cut out these words and pile them up next to me. Once I feel complete I will sort out the words. Usually a theme arises and I will glue the words down in my journal. Or a lot of times I simply gather up the words and place them in my “Tray of Words”. This tactile and unconscious thought will always reduce the angst I felt previous to when I started. AND, I have uncovered and brought out INNER wisdom I didn’t have previous to starting. This inner wisdom feels peaceful and heart-felt. It’s as if my Soul has been stirred and brought about wisdom I was in need of hearing. When my grandmother passed away at 96 years young I was sad and yet I knew she was in a place of love, happiness, joy and beauty. I knew this because on our last visit at a local convalescent hospital I witnessed her having extreme joy. Mumu sat in a wheel chair in her room, eyes closed as if she might have been sleeping. As my mom and I tried to speak with her, Mumu all of a sudden let out a beautiful squeal of joy and swinging her body as if she were on a swing. Back and forth her body and legs moved, pumping her body as if trying to go higher and higher. I don’t remember if she shared with us through words what she was experiencing, but the movement of her body told the story of pure joy and exhilaration. Mumu’s mind was somewhere else other than the room, in the wheelchair at the convalescent hospital. She passed away shortly after that visit. However, my memory of her swinging and experiencing pure bliss certainly consoled my head and heart. I think of Mumu often. This morning I wanted to create with my new linoleum blocks. Instantly, the feeling of my grandmother, Mumu, filled my heart and I knew I wanted to create the swing she might have been on. As I carved out the scene I felt as if Mumu was right there with me in my studion. Her love as palpable. She was providing support as I tried something new. This was my first experience with linoleum blocks. I enjoyed the process of drawing the scene, carving out the details and inking it up to see the end result. Each time I inked and printed the block I would go back in and carve a little more to clean up the lines a bit. I look forward to creating many more scenes with the linoleum blocks. My experiences in life definitely cross over into my artwork. I feel blessed to have found a way to express myself through art. I have had this blog site for over two years. I intuitively knew someday I would like to write. However, my lack of confidence kept me from sharing my journey. All the negative self talk was so loud. This morning, the energy inside and around me was different. I have been visualizing a rubber stamp shape, a flower petal design. One which could be repetitive and had space to add my own pen work in between the lines. This design kept showing up in my thoughts until finally I was dreaming about it last night. Once I dropped my son off at school this morning I sat down and created the stamp. I have to say creating this stamp from start to finish in all of 20 minutes brought so much JOY to my heart. I had a smile on my face when I placed the ink on it and pressed it out on paper. The image was exactly, if not better, than the image in my head. I have many ideas flowing through me as to how I can create with this stamp. Since this particular petal stamp turned out so well I looked in my sketchbook to see what else I could carve out of the small leftover piece of rubber. I found a bird sketch. I quickly traced the image with my pencil, rubbed the sketch over the rubber and began using my carving tools. In all of 5 minutes my next rubber stamp was born. I am not sure why these two creations have brought me so much happiness and WHY it has encouraged me to get up and begin writing on my blog. All I know is that I am looking forward to my day of being a CREATIVE person. I look forward to being ME today. AND I look forward to sharing my journey on this blog. Let’s see where this next chapter in my journey will take me.